Kailyn was in need of some major dresser help. Her dresser from years ago that we purchased at Ikea was falling apart. I mean, it was embarrassingly falling apart! It only had 3 drawers in the first place. Not nearly the space that she needed. 1 of the 3 drawers were no longer able to even fit into the fame, it was so broken. Kailyn kept that drawer on her floor with clothes flowing out everywhere. I wanted to give her as much space as possible so she had NO excuse not to put her clothes away. I think the previous owners tried to give it an antiqued/it's been through a fire look?? 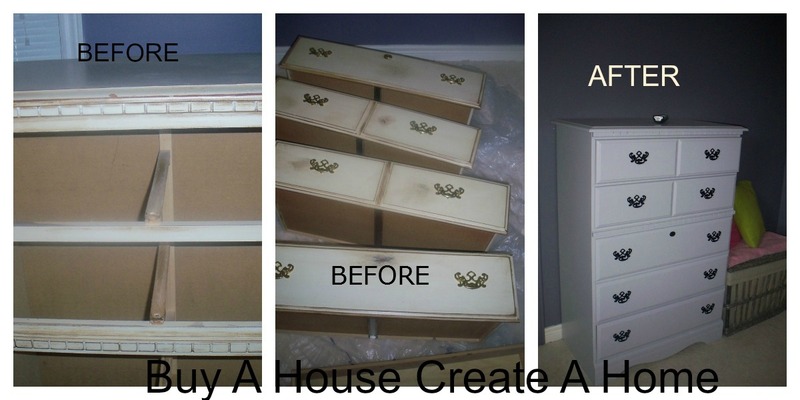 I wanted something modern but that still had character and this dresser was perfect. The dresser has great details from the shape of the handles and the little key hole accent piece on the 3rd drawer, super cute, to the square detailing around the top and middle of the piece...some real nice details. First I took off all the handles and key accent piece. I washed and sanded the dresser down, trying to get rid of any marks and old paint residue from the previous owners. 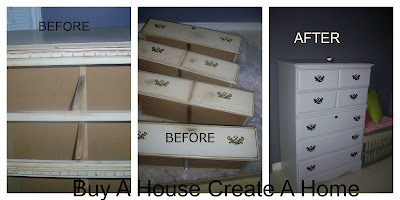 I started to paint it and about 3 coats in to it I was happy with the finish product. We spray painted the handles and the key accent piece a glossy black and then sprayed on a clear coat hoping to protect them from any chipping. I was torn between a silver or black finish. I'm happy with the black. and that was that, I was done and I was so happy with the look.